Tour de France organisers have come up with a cracking Etape for 2010 to celebrate 100 years since the Pyrenees first inclusion. 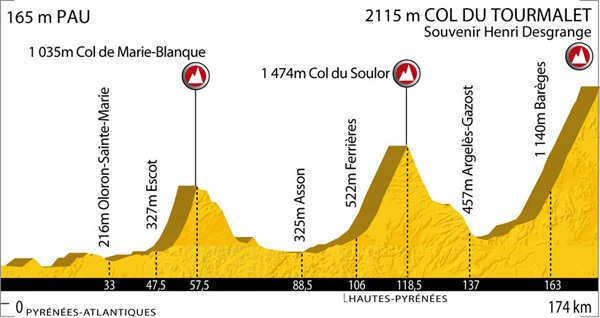 The punishing 174-kilometre route takes in the Col de Marie-Blanque (1035m), Col du Soulor (1474m) before the mountain-top finish at the legendary 2115m Col du Tourmalet. As usual, the Etape will sell out well in advance and anyone hoping to be among the 9,500 riders lining up at the Place Verdun in Pau next July will need to book a place now. Entries from the UK can only be made via official ASO-approved operators listed below. Nikki Harris starts her first cyclo-cross of the season in the colours of the AVB team at the World Cup event in Nommay on Sunday [November 8]. The 22 year old crashed out of the World Championship road race in September with an initial prognosis of a badly damaged shoulder. “I saw a specialist back home and it wasn’t the shoulder but a broken collarbone, so it wasn’t as bad as I first thought. I only had a couple of weeks off the bike and then I have been training hard on the turbo,” she said. Also making a return on Sunday is five-time World Champion Hanka Kupfernagel. The German has been out of action since June with injuries. Brits Gabby Day (Cycle Fit) and Helen Wyman (Kona) also race at Nommay, with Wyman aiming for another podium position after her fine third place at the European Championships. Ian Field (Hargroves Cycles) competes in the elite men’s event. The UCI Para-Cycling World Championships kick off today at the Manchester Velodrome with Beijing heroes Darren Kenny, Simon Richardson and Jody Cundy in action. World Masters time trial champion Sarah Storey starts the hunt for gold on Saturday with the pursuit. The fifteen-strong GB team features newcomers Lora Turnham and Neil Fachie alongside experienced hands Aileen McGlynn, Rik Waddon and Mark Bristow. Fast Track Coaching holds its first track clinic weekend of 2010 at Newport Velodrome starting on Saturday, January 2. Coaches Dave Le Grys – with a gold medal and new World Record to his name at the recent World Masters games – and Lee Povey lead the two-day clinic with particular focus on sprinting. Day one looks at the 200m time trial in detail, with sprint-specific training drills covered on Sunday. Video feedback and expert analysis, one-to-one coaching, and increased track time over previous Fast Track weekends are all included. Cost for the two-day course is £150. See www.fasttrackcoaching.biz for further details.